So, Argentina made the World Cup final and I made dulce de leche to celebrate. As if you even need an excuse for something as brilliant as dulce de leche but hell, the restaurant’s opening at 3am for the game and I’ma need something to jolt my sleepy brain into bilingual bartender mode. For the uninitiated, it’s like caramel but so. much. better. 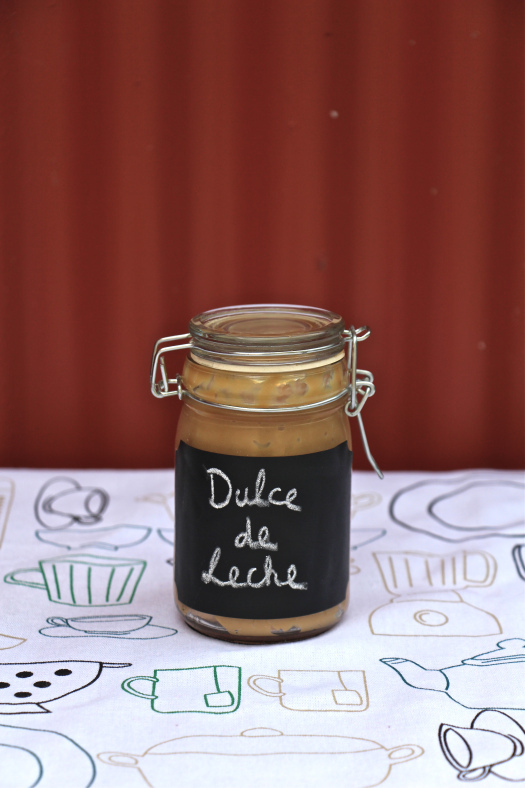 Dulce de leche on a banana is the ultimate combination, but you can use it for topping on just about anything, as a cake filler, or for alfajores. I know I’ll be spooning the leftovers into my porridge, too. Just don’t tell anyone. This is a very basic recipe and it won’t yield dulce de leche quite as good as the stuff in Argentina but it’s close enough, really. I make it in a batch and what I don’t use in alfajores gets given to friends or kept in a jar in the fridge. For reasons. Bain-marie that bad boy, taking it out to whisk every 20 minutes or so until it turns roughly the colour in the picture. I use a pyrex dish inside a deepish baking tray with some foil over the top. Obviously, longer baking = thicker dulce de leche. It’ll come out gluggy and lumpy and strange, but just keep whisking and you’ll end up with smooth, sweet deliciousness. I know it all sounds very vague, but you just have to trust this one. It really is that simple.